I had someone send me layouts from one of my kits! Thanks psychozoe! I just love it when I get to see what someone has done with my work. I've started a slideshow on the left to display what people are kind enough to share with me. 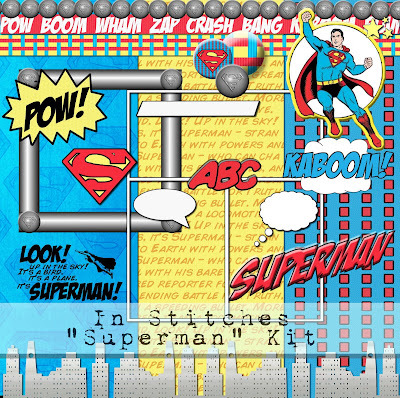 You can check out psychozoe's layouts on her blog here. 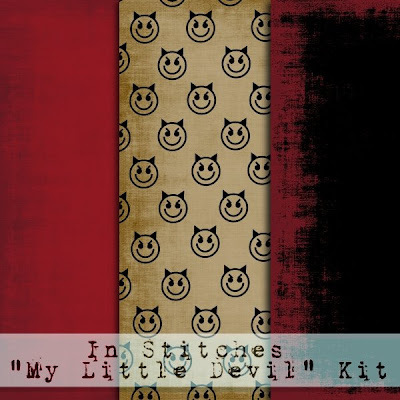 Today I am giving away the elements for the "My Little Devil" kit. Click on the preview to download. I'd love to see any layouts you've created with the kit. Happy scrappin'. 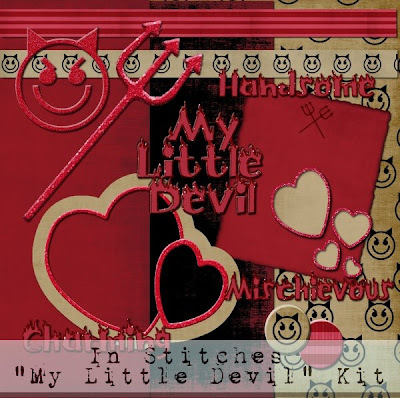 Here's a free quickpage I made with my new kit "My Little Devil." 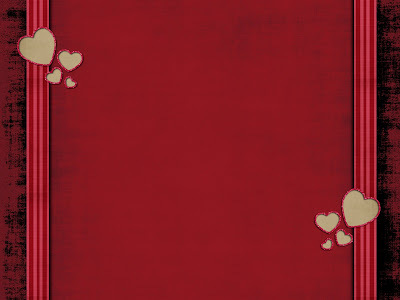 I wanted to make a Valentine kit for my son that wasn't too "girly." Just click on the preview to download. Happy scrappin'. Change your template to Minima (this is the only way this will work) If this makes you nervous, save your current template to your desktop. ...And here's the last of it! The alpha to go along with the kit. I hope you all enjoy the kit. Happy scrappin'. Click on the image to download. Hello all. 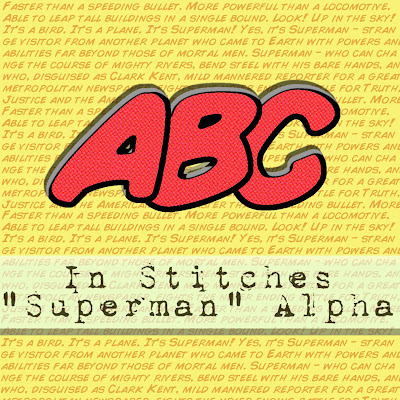 Today I have the "Superman" wordart for you. I'm so happy you scrappers love it so much. And I'd LOVE LOVE LOVE to see your layouts with the kit. I'll be back with the alphas tomorrow. Happy scrappin'. First of all, let me say WOW! I can't believe 170+ of you downloaded the papers. That makes me very happy. Thanks for the comments and love. Today I have the first set of elements. It includes the buttons and some other fun stuff. I'll be back with the second set tomorrow. Click on the link underneath the preview to download. Happy scrapping! 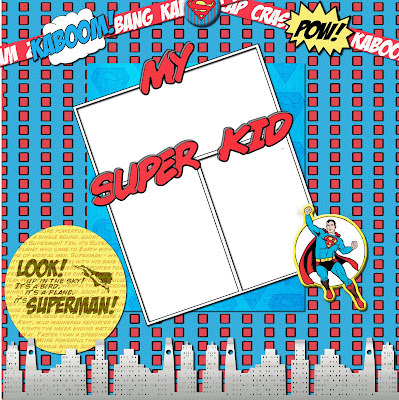 Today I have the "Superman" kit papers for you. Instead of connecting the download to the preview, I thought I'd just link the download underneath the preview. If you click on the preview, you'll get a closer view of the papers. Enjoy! I made my new kit. "Superman", with inspiration from my extrememly active one year old son. I tried to give the papers and elements a comic book feel by turning up the RGB noise. Today I have a quickpage for everyone. Check back periodically as I will be giving away the papers, elements, etc. Enjoy scrapping those energetic little ones. If your child is like mine, he gives you plenty of great photo opportunities. As always, I'd love to see what you create. Comment if you'd like a blog background or desktop made with this kit. I'd be happy to make them, but I'm not sure how many of you would be interested. Click on the preview to download. Enjoy!